After enduring a slipped disc from an accident 4 years ago, Hamdi couldn’t resume his career as a plumber. “After the deterioration of Hamdi’s physical condition, our life turned upside down,” Sabrin, Hamdi’s wife relates. Their major concern was to fulfill their children’s needs and not go to bed hungry. Always a good provider, it was very hard for Hamdi to feel helpless and incapable of supporting his wife and six children with basic home needs, especially when they were not used to doing without. With no source of income, Hamdi had to find a way to support his family. They borrowed food from nearby grocery stores, and paid them back whenever they had money. Then, the family received great news. Hamdi’s family at their house with their youngest child holding the e-voucher provided by CRS. Photo by Mohamed Reefi for CRS. 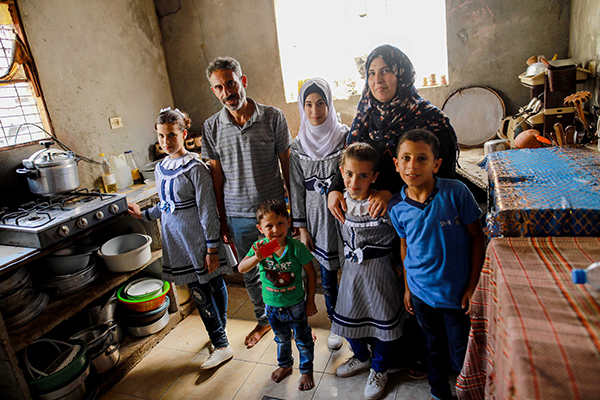 Hamdi’s family was selected in the Gaza Emergency Appeal for Food and Non-Food E-Voucher program with Catholic Relief Services for a period of 6 months. The project supplies vulnerable households with a debit-like card that is replenished at the beginning of each month. The value of the card depends on family size with a minimum and maximum value. Families can buy any food or hygiene product from shops close to their homes. The main items in the family’s cart each month are cheese, yogurt, cooking oil, pasta, tomato salad, beans, frozen fish and chicken, and shampoo. All family members go to the shop together and each one participates in the shopping process. Hamdi couldn’t buy his children items like chocolates and snacks for a long time, but now he has a chance not to avoid their requests for a while. He can also bring them fish and other necessities from 15 local shops approved by CRS. Sabrin eagerly awaits the beginning of each month to meet his family’s needs. This is the first time they’d participated in an e-voucher program that gives them dignity where “we can go and buy food, any food of our choice.” The family is grateful for being able to avoid debt, embarrassment and hunger for the period of the project.